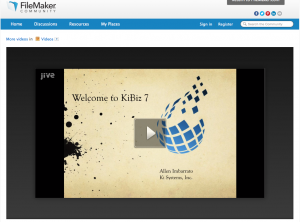 KiBiz Systems President, Allen Imbarrato, joins FileMaker SBA Spotlight to present KiBiz 7, the latest version of the highly flexible KiBiz CRM ERP Accounting software developed by KiBiz Systems over the past 18 years. The FileMaker SBA solution spotlight series, is a series of webinars that can be viewed on FileMaker’s community website. In his webinar Allen and one his long time clients, Interstate Books for School, gave a 45 minute presentation, that can be viewed here, covering how the flexibility of KiBiz 7 can help small businesses automate, integrate, and accelerate their business processes and workflow. KiBiz 7 has been in a limited early release this year, and will be in full release in 2016, along with KiPoint 3, a powerful FileMaker POS solution that KiBiz Systems has been developing over the last few years. A customized version of KiPoint is currently being used by fashion retailer Brandy Melville, you can read more about that here.